Thanks to the Mexican herbs used, these empanadas will positively surprise you. Due to the light dough, these empanadas are perfect as a snack or appetizer. Cut the leek into thin rings. Fry the minced beef and the leek in a splash of olive oil. Squeeze out the garlic cloves above the minced beef and stir them through the beef. Once the beef is done, add the tomato paste and bake for 1 – 2 minutes. Add the meat herbs and stir them through the mixture. Open the can of dough, roll the dough out and cut the slabs loose along the cutting lines. 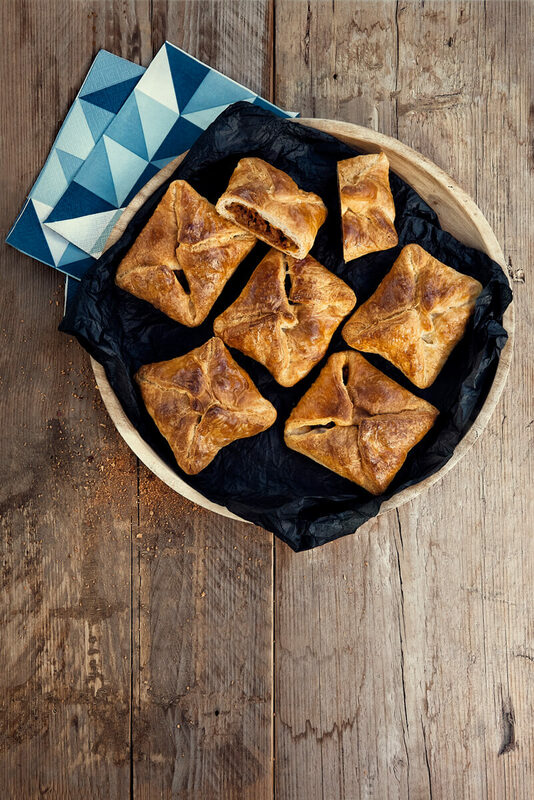 Divide the beef mixture over the triangular croissants, fold the tips towards each other and press the edges down well. Cover the empanadas with a little bit of milk or beaten egg. Bake the empanadas in the oven for 15 minutes until the dough reaches a nice golden brown color.